Research on Islamophobia has so far focused predominantly on Western European societies. In view of the hostile reactions towards Muslim refugees shown by Eastern European governments, there is still a sizeable research gap with regard to Islamophobia in Eastern Europe. The aim of our article is to survey the extent of anti-Muslim prejudice beyond Western Europe and to shed light on its social-psychological determinant patterns. Our results show that the rise of Islamophobia is a pan-European phenomenon, and it rests upon similar social-psychological underpinnings. Perceptions of threat and ethnocentrism turn out to be its core drivers. Beyond these similarities, Islamophobia is more widespread in Eastern Europe. This empirical pattern is in line with the theoretical assumptions of the contact hypothesis. The absence of Muslim communities in Eastern Europe leads to fewer contacts or friendships with immigrants, and more sceptical perceptions of intergroup contacts. These factors strengthen a social climate in which anti-Muslim prejudice prevails. Introduction – Islamophobia, the New Orientalism? A spectre is haunting Europe – the spectre of Islamophobia. What is the newsworthiness of this statement, one might ask. Unease, reservation, fear and even hatred of Islam and Muslims have long traditions in Europe. Since Edward Said’s seminal study on “Orientalism”, it is widely acknowledged that the West has associated Islam with negative images for hundreds of years. The perception of Islam as an aggressive menace to Western societies has gained in importance in the aftermath of the Cold War and in particular since the terrorist attacks of 9/11. Surveys show that derogatory attitudes towards Islam and Muslims are widespread among Western publics. Given the climate of fear created by a number of terrorist attacks committed by the so-called Islamic State (e.g. in Paris, Marseille, Barcelona, Berlin), it seems unlikely that the career of Islam as the scapegoat of Europe has yet reached its climax. The new issue is that Eastern European governments joined the anti-Islam chorus during the so-called refugee crisis of 2015. One indication of this trend is the joint action of the Visegrád states against binding quotas for the allocation of refugees to individual EU member states. In this vein, the rejection of Islam and Muslims is expressed loudly. Slovakian prime minister Robert Fico openly states that “Islam has no place in his country”. Czech President Miloš Zeman calls Islam “a religion of death” and argues that to speak of “moderate Muslims” is as contradictory as referring to “moderate Nazis”. For Jaroslaw Kaczyński, the strong man of the Polish Law and Justice Party, the influx of migrants poses a threat to Europe’s “Christian identity” as the ultimate goal of Muslims is the “establishment of Sharia law”. Last but not least, Victor Orbán portrays Hungary as the last “bastion against the Islamicization of Europe”. In his view, Muslims are a “danger to Europeans’ employment and living conditions”. Research on Islamophobia has so far focused predominantly on Western European societies. With regard to the hostile reactions towards Muslim refugees of Eastern European governments, one might argue that there is still a sizeable research gap when it comes to Islamophobia in Eastern Europe. The aim of our article is to examine the extent and causes of derogatory attitudes towards Muslims beyond Western Europe. First, we ask whether Islamophobia is really on the rise in Europe and whether it is (perhaps) more widespread in Eastern than in Western Europe? Second, we are interested in the potential causes of anti-Muslim attitudes. Given the fact that Muslim communities are virtually absent in most Eastern European societies, we wonder whether the determinant patterns of anti-Muslim prejudice vary between Eastern and Western Europe. To shed light on these questions, we consult theories of social psychology. The statements of Eastern European politicians reveal that Muslims are perceived as a threat in contemporary Europe. Judging individuals negatively because of their group membership is the essence of prejudice, and social psychology offers a long tradition for the scientific study of the cognitive and social processes that promote these attitudes towards outgroups. Not surprisingly, established theories of social psychology such as the Social Identity Theory , Integrated Threat Theory , and the Contact Hypothesis  have found their way into studies that deal with the causes of Islamophobia. To gauge the extent of Islamophobia and to investigate its causes from a comparative perspective, we rely on representative public opinion surveys. Public opinion surveys serve our scientific objective for two reasons. First, they collect their data by means of a random selection scheme. An aggregation of individual-level data (e.g. the number of people that support a ban on Muslim immigration) allows us to describe the prevalence of anti-Muslim attitudes in European societies. Second, many public opinion surveys contain acknowledged indicators which enable us to measure empirically the constructs that are integral parts of theoretical explanations for the formation of prejudiced attitudes. Applying quantitative methods allows us to test the explanatory power of these theories and to provide information on the social-psychological causes that drive individual anti-Muslim prejudice. Another advantage of public opinion surveys – such as the European Values Survey  and the European Social Survey  – is that they have been carried out in Eastern as well as Western European societies. A structured comparison of the causal drivers of Islamophobia in Eastern and Western Europe allows us to scrutinize whether anti-Muslim prejudice draws upon general sources, or whether there are peculiarities within different national contexts. Islamophobia – Dazzling Term or an Emerging Comparative Concept? What exactly do we mean by Islamophobia? First of all, we should state that Islamophobia is a highly contested term. While the term is widely used by organizations in civil society , and by political actors , its emergence as a comparative concept in the social sciences is rather new. A great deal of attention in the research field is dedicated to the subtle distinctions (and sometimes flawed boundaries) between Islamophobia, criticism of Islam and its adherents, and outright hostility towards them. As highly diverse phenomena are discussed under the dazzling label of Islamophobia, some authors even advocate avoiding the term in the academic realm. However, Bleich (2011) argues that social scientists would be ill-advised to do so, as the term is intended to label a social reality; that is to say, “Islam and Muslims have emerged as objects of aversion, fear, and hostility in contemporary liberal democracies”. In this vein, Bleich (2011) proposes a widely used definition of Islamophobia, which is “indiscriminate negative attitudes or emotions directed at Islam or Muslims”. We adopt this definition, as it is widespread in the academic community, but we limit its scope to indiscriminate negative attitudes towards Muslims. There are good empirical and normative reasons to do so. Using factor analysis, Uenal (2016) presents evidence that attitudes towards Islam and Muslims comprise two different dimensions. From a normative perspective, a too broad understanding of Islamophobia (which encompasses a criticism of Islam) is problematic as it places the legitimate criticism of religion (e.g. for its subordination of women) under the suspicion of prejudice. This narrower understanding of Islamophobia is largely in line with Allport’s (1971) characterization of prejudice, which he describes as “an antipathy based upon a faulty and inflexible generalization”. In short: We use the term Islamophobia to describe negative attitudes towards Muslims based on their perceived religious background. As non-practising Muslims face discrimination because of their ethnocultural characteristics, it is an alleged group identity that drives anti-Muslim prejudice. Thus, there are good reasons to explore its causes in the light of social-psychological theories of prejudice and stereotyping. At a basic level, anti-Muslim prejudice arises from a process of categorization. Individuals attribute negative characteristics to a large human group based on their perceived religious background. We argue that Social Identity Theory is a good starting-point to identify the factors that determine the emergence of Islamophobia, as the process of categorization is closely interlinked with the construction of collective identities. Social Identity Theory assumes that prejudice arises from an “actor’s identification of themselves and the others belonging to different social categories”. This categorization process rests upon a comparison in which “the in-group must be perceived as positively differentiated or distinct from the relevant out-groups”. This comparison serves psychological needs as individuals strive for a positive self-image. A precondition for Islamophobia to emerge from this categorization process is that individuals “have internalized their group membership as an aspect of their self-concept: they must be subjectively identified with the relevant in-group” . It is at this point that nationalism comes into play. Nationalism is a powerful anchor for an individual’s social identity and derives from “his/her knowledge of his/her membership of a social […] group together with the value and emotional significance attached to it”. We define nationalism as an individual’s “subjective or internalized sense of belonging to the nation”. As a nation is a socially constructed community imagined by people, nationalism manifests itself in affective attitudes towards collective symbols, a common language, history, and traditions. Nationalism is likely to accompany Islamophobic attitudes as it establishes dividing lines between “us and the others”, and therefore sustains exclusive group identities. Hypothesis 1: Individuals that strongly identify with their nation are more likely to feel prejudice towards Muslims. Another powerful source of in-group identification seems to be religion. Eastern European politicians refer to the “Christian heritage” of their nations to justify their country’s refusal to host Muslim refugees. Consequently, it is worth analyzing whether and how religiosity relates to Islamophobia. Religiosity is a multifaceted personal experience and encompasses religious beliefs (e.g. belief in God), religious behaviour (e.g. attending religious ceremonies), and a sense of religious belonging (e.g. allegiance towards a certain religious denomination). Across the board, the potential effects of religiosity on prejudice are considered as highly ambivalent. On the one hand, one might argue that religion breeds values such as solidarity and altruism. On the other, though, religiosity is found to be correlated with prejudice and xenophobia. We argue that religiosity accompanies anti-Muslim prejudice for two reasons. First, religion is a source for identifying with an in-group beyond nationalism. Second, the very existence of Muslims and their sheer “religious otherness” can induce a feeling of threat among the in-group and therefore aggravate the us-versus-them divide. Hypothesis 2: Religious individuals are more likely to feel prejudice towards Muslims. Of course, there is no automatic link between identification with an in-group and prejudiced attitudes towards out-groups. The categorization process is more likely to emerge if the respective out-group is perceived as an object of fear. This is certainly the case with Islamophobia: the scapegoating of Muslims has a long tradition in European history. On top of that, there are good reasons to assume that terrorist attacks help to consolidate such feelings. The impact of fear on prejudiced attitudes occupies a central position in the Integrated Threat Theory, which assumes that an in-group’s realistic and symbolic perception of threat is the core driver of prejudice. If the in-group considers the very existence of an out-group to be a risk to its physical and material well-being, then this indicates a realistic threat. When Victor Orbán states that “Muslim refugees may turn out to be terrorists”,  then this is a clear attempt to strengthen realistic perceptions of threat among his compatriots. We assume that prejudice is a likely outcome if individuals fall in line with these kinds of anti-Muslim stereotypes. Much of the anti-Muslim rhetoric that we have described aims to encourage symbolic perceptions of threat among Eastern European citizens. The essence of symbolic fears is the perception of sharp “group differences in morals, values, standards, beliefs and attitudes”. Miloš Zeman’s characterization of Islam as a “religion of death” implies a dichotomy between the violent and brutish culture of Muslims and the peaceful and civilized qualities of the Czech population. Key phrases like the alleged “Islamicization of Europe” tap into the same seam. If Eastern European citizens are susceptible to this kind of rhetoric, then attitudes of rejection towards Muslim immigrants are a likely outcome. In the long run, we assume that the combination of identifying with the in-group (via nationalism and religiosity) and (realistic and symbolic) perceptions of threat vis-à-vis out-groups accompanies more rigid forms of “in-group favouritism and discrimination against the out-group”. This state of mind comes close to Levinson’s (1949) notion of ethnocentrism. The perception of a sharp divide between us and the others is exaggerated to the extent that “out-groups are the objects of negative opinions and hostile attitudes; in-groups are the objects of positive opinions and uncritically supportive attitudes; and out-groups are regarded as properly subordinate to in-groups”. We consider ethnocentrism to be a more valid explanation of Islamophobia than nationalism. National identification in terms of constitutional patriotism may fulfil positive functions for a democratic political community. Ethnocentrism, however, is likely to play a harmful role as it “involves blind attachment to certain national cultural variables, uncritical conformity with the prevailing group ways, and rejection of other nations as out-groups”. Even though we consider collective identities, the perception of threat, and ethnocentrism as important causes of Islamophobia, we wonder whether the virtual absence of Muslim communities in Eastern Europe is a relevant explanation in its own right. At least, advocates of the Contact Hypothesis_would raise this question. The contact hypothesis assumes that an individual’s contact with members of an out-group is conducive to tearing down existing prejudice. Once again, there is no automatic mechanism link this to less prejudiced attitudes. Allport (1971) argued that the assumed mechanism depends upon the type (e.g. teammates, friendship and kinship) and quality of the contact situations. Bearing in mind this criticism, we nevertheless assume that individuals who stay in contact with out-groups, make friends with people from other ethnicities, and perceive these contacts as positive are less likely to feel prejudice towards Muslims. However, we argue that it is important _to distinguish between the individual and the societal level. At the individual level, we expect similar effects among citizens in Eastern and Western Europe. Given the small number of Muslim communities, this effect at the individual level is lacking in Eastern European societies, however. Most citizens in Eastern Europe seldom meet Muslims. Consequently, Eastern European citizens tend to have parasocial contacts with Muslims. In the absence of opportunities for direct contact, it seems likely that media consumption (e.g. television and the Internet) creates the illusion of direct contacts. Parasocial contacts give rise to anti-Muslim prejudice for two reasons. First, the mass media has in general a negative news bias. Second, news coverage of terrorist attacks committed by Islamists shapes the prevailing image of all Muslims. In doing so, the media facilitates prejudice against Muslim immigrants and gives rise to a phenomenon that could be described as Islamophobia without Muslims. Our empirical study pursues a threefold objective: we shed light on the prevalence of Islamophobia in European societies, its development in the last three decades, and its potential social-psychological determinant patterns. In doing so, we rely on public opinion polls such as the European Values Survey and the European Social Survey. The timing of these surveys fits our research goals perfectly. The European Values Survey encompasses points in time before (1999) and after (2008) the terrorist attacks of 9/11. In addition, the European Social Survey was conducted immediately prior to the so-called refugee crisis (2014). The data allow us to show that there is a certain continuity of Islamophobic sentiments and of the social-psychological personality traits that enable such sentiments – which also indicates that Islamophobia is not a by-product of the polarized debates that accompanied the so-called refugee crisis. We collected data for the 28 member states of the European Union to provide general information about the anti-Muslim climate in European societies. Regarding the social-psychological drivers of Islamophobia (which implies an analysis at the individual level), we decided to compare Eastern and Western European societies (e.g. Czech Republic, Poland, Hungary, Slovakia, France, Germany, Great Britain, and the Netherlands). This case selection resembles the idea of a Most-Different-System-Design, as we compare cases with highly distinctive characteristics at the system level (e.g. countries with significant and marginal Muslim communities), while assuming similar causal patterns (Hypotheses 1-5) that drive anti-Muslim attitudes. But, as already mentioned, we consider the diverging sizes of Muslim communities – which accompany the low level of opportunity for contact in Eastern Europe – as an important explanation of Islamophobia in its own right (Hypothesis 6). To scrutinize this assumption, we will present societal-level evidence for the member states of the European Union that have been surveyed by the European Social Survey (2014). In Table 1, we list the operationalization of our theoretical constructs. To provide a descriptive overview of the magnitude of Islamophobia in Europe since the end of the 1990s, we present approval ratings of items that were designed to measure anxiety with regard to Muslims (see Table 2). To test our theoretical assumptions about the social-psychological underpinnings of Islamophobia, we run several logistic regression models (see Table 3). It is the binary nature of our dependent variable that makes logistic regression the appropriate technique for us. At its core, logistic regression helps us to understand which of the two groups of the binary dependent variable people ultimately fall into: Do they accept or do they reject Muslim neighbours? The basic idea of a (logistic) regression analysis is to link a dependent variable to different independent variables. If we apply this logic to our research interest, it means that we consider nationalism, religiosity, perceptions of threat, and ethnocentrism as independent variables that have an impact on our dependent variable, which is Islamophobic attitudes. We follow the usual practice of sociological analysis and control for a respondent’s educational level, gender and age. Regression analysis offers a mathematical procedure to analyze the relative impact of the independent variables and to assess the overall explanatory power of our theoretical model. In less technical terms, regression analysis allows us to investigate which social-psychological factors really matter for Islamophobia, and which we can ignore. The effect of a factor sometimes vanishes if we control another factor. Is it, for example, really nationalism or ethnocentric worldviews that drive anxiety with regard to Muslims? Furthermore, a regression analysis helps us to describe the direction of an empirical relationship. In our example, it is odds ratios that provide information about the probability that respondents will reject Muslims as their neighbours compared to the probability that they will accept them. Source: European Values Survey & European Social Survey. Own figure. Odds ratios can range between 0 and infinity. An odds ratio of less than 1 indicates a negative relationship, while an odds ratio of more than 1 describes a positive relationship. In Germany, for example, each unit increase on the nationalism scale increases the odds of rejecting a Muslim neighbour by a factor of 2.35 (see Table 3). Finally, we will present scatterplots to shed light on the explanatory power of the contact hypothesis. A scatterplot is a data visualization tool that allows us to map the relationship between the intensity of contacts with migrants and the prevalence of anti-Muslim attitudes in European societies. Is Islamophobia on the rise and is it more widespread in Eastern Europe than in Western Europe? Looking at Table 2, which displays the evolution of people’s susceptibility to anti-Muslim resentments in Europe since the late 1990s, we can conclude that Islamophobia is on the rise in Europe. However, there is no sign that there was a dramatic boost in anti-Muslim prejudice between 1999 (19.9%) and 2008 (21.3%). These figures indicate that anxiety towards Muslims was already at a high level before the terrorist attacks of 9/11. The magnitude of Islamophobia reached its (temporary) peak just before the so-called refugee crisis: among the European nations that surveyed by the ESS (2014), support for an immigration ban on Muslims is close to 25%. 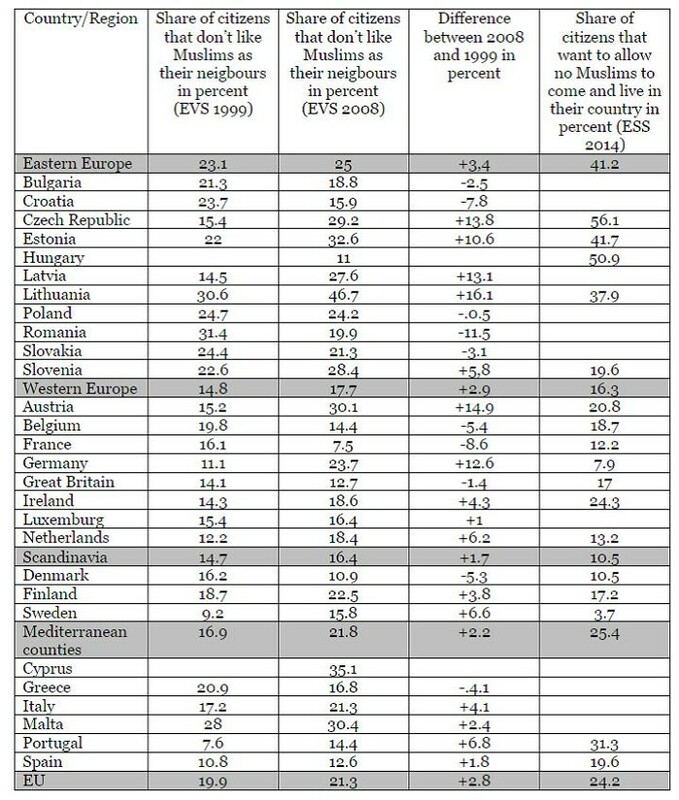 This general overview of the prevalence of Islamophobia among member states of the European Union veils significant differences between Europe’s different regions. Islamophobia is most widespread in Eastern Europe. We can observe this phenomenon at every point in time that we studied. The high prevalence of Islamophobic attitudes was already observable in the late 1990s (23.1%), and even its upward trend between 1999 and 2008 (+3.4%) was most clear-cut among Europe’s post-socialist nations. At this point, the rise of attitudes of rejection regarding Muslim neighbours in countries such as Austria (+14.9%) and Germany (+12.9%) should certainly not be played down, but in general the magnitude of reservations towards Muslims was much smaller among Western European (14.8-17.7%), Scandinavian (14.7-16.4%), and Mediterranean (16.9-21.3%) countries. This empirical pattern continues right up until the so-called refugee crisis: support for an immigration ban for Muslims is most widespread among Eastern European societies (39.9%), and clearly exceeds the average approval of restrictive immigration policies in Western Europe (16.3%), Scandinavia (10.5%), and Mediterranean countries (25.4%). Miloš Zeman and Victor Orbán’s hostility towards Muslim refugees should not surprise us at all, if we consider the fact that more than half of the respondents in the Czech Republic (56.1%) and Hungary (50.9%) are in favour of a Muslim ban. It can be concluded that Islamophobia is hardly a new trend in Eastern Europe, but it appears likely that it was intensified by the influx of Muslim refugees. The rise of anti-Muslim attitudes in Hungary between 2008 (11%) and 2014 (50.9%) is an alarming indication of this trend. Social-psychological drivers of Islamophobia: collective identities, perceptions of threat, ethnocentrism, or just a lack of contact? Beyond nationalism, our results confirm Allport and Ross’ (1967) wisdom that religion has ambivalent repercussions for prejudiced attitudes towards out-groups. While devout people in Slovakia tend to reject Muslim neighbours (odds ratios = 1.93, p = .008), religiosity has the opposite effect in Great Britain (odds ratios = .29, p = .001) and Germany (odds ratios = .39, p = .001). In these cases, religious individuals take the Biblical commandment of love-thy-neighbour in the literal sense, and express less hostility towards Muslims than their non-religious fellow citizens. We assume that the empirical pattern in Germany corresponds to differences between Eastern and Western Germany. Eastern Germany is not only a stronghold of people without religious affiliations; its citizens are also more likely to express anti-Muslim prejudice. Beside these peculiarities of national contexts, our results show that Islamophobia rests upon quite similar social-psychological underpinnings in European societies. Essentially, it is a mixture of perceptions of threat and ethnocentrism that drives anxiety with regard to Muslims. As we have already explained, there is a distinction between realistic and symbolic perceptions of threat in Integrated Threat Theory. With regard to Islamophobia, realistic perceptions of threat seem to be the decisive driver. Thus, we can observe a uniform effect: from the West to the East, European citizens that regard immigrants as a threat to their physical and material well-being tend to reject Muslims in their immediate neighbourhood (odds ratios range from 1.83 in Slovakia to 10.13 in Great Britain). Symbolic perceptions of threat, by which is meant perceiving immigrants as a threat to one’s own culture, turns out to be an intensifier of Islamophobia in Hungary (odds ratios = 1.74, p = .05), Slovakia (odds ratios = 2.32, p = .004), and Germany (odds ratios = 2.23, p = .004). Overall, symbolic perceptions of threat are of minor importance compared to realistic perceptions. Put bluntly: Islamophobia is caused more by fears connected to economic and security issues than it is by the diffuse fear of an Islamicization of Europe. As described above, we cannot observe strong and uniform effects of nationalism and religiosity. However, it would be premature to conclude that in-group favouritism and pejorative attitudes towards out-groups (which are the essence of ethnocentrism) do not matter at all for Islamophobia. Our empirical results reveal unambiguously that “ethnocentric worldviews drive hostility towards Muslims in the neighbourhood” (odds ratios range from 10.94 in Slovakia to 122.90 in Great Britain). Source: EVS 2008. Note: Entries are Odds Ratios. Standard Errors in parentheses. p <.10, p <.05, p <.01. Own figure. Lastly, it should be noted that our control variables show only small effects. Compared to Slovakian men, Slovakian women are slightly more likely to accept Muslims in their neighbourhood (odds ratio = .76, p = .080). In Great Britain, it is the elderly that are more likely to feel discomfort with regard to Muslims (odds ratio = 4.65, p = .002). As the education level of respondents turns out to be a non-significant parameter, one might conclude that Islamophobia is a phenomenon that shapes the entire range of the social stratum. At this point, it is reasonable to raise a caveat: the explanatory power of our theoretical model is much higher in Western Europe (Pseudo-R-Squared range from .16 in Germany to .21 in France) than in Eastern Europe (Pseudo-R-Squared range from .07 in Slovakia to .12 in the Czech Republic). Against the backdrop of these results, the question arises whether factors at the societal level – such as the smaller sizes of Muslim communities in Eastern Europe – exert unique effects. As the scatterplot in the upper left-hand corner (see Figure 1) illustrates, there is indeed strong evidence of a phenomenon that we label Islamophobia without Muslims: the smaller the factual presence of Muslim minorities in European societies, the higher the average support for a Muslim ban. Contact with immigrants can be considered an antidote to Islamophobia. In this regard, individuals in Western and Eastern Europe do not differ dramatically. Citizens that have contact with immigrants, make friends with people from other ethnicities, and perceive these contacts as beneficial tend to reject an immigration ban for Muslims. Yet, since the antidote of contact is unequally distributed among European societies, one might argue that this individual-level effect lacks an amplifier in Eastern Europe. The sheer absence of Muslim communities in these parts of Europe translates into fewer contacts and friendships, and more sceptical perceptions of intergroup contacts. All these factors, however, accompany a social climate in which anti-Muslim prejudice has gained the upper hand (see Figure 1). (1) Islamophobia is on the rise in Europe. However, there is no sign of a rapid surge as anti-Muslim prejudice was already at a high level before the terrorist attacks of 9/11. Anti-Muslim attitudes reached their (temporary) peak just before the so-called refugee crisis: the average European support for a Muslim ban in 2014 was approximately 25%. As there have been several terrorist attacks since 2015, it seems likely that this percentage provides a snapshot that is outdated. (2) Islamophobia is most widespread in Eastern Europe. Restrictive immigration policies vis-à-vis Muslims are quite popular in Eastern European countries, where the approval ratings for a Muslim ban are considerably higher than in the rest of Europe. On these grounds, the joint action taken by the Visegrád states to oppose binding quotas for the allocation of refugees is very much in line with public opinion. (3) The social-psychological determinant patterns of Islamophobia do not vary dramatically between Eastern and Western European societies. There are peculiarities in every country, but overall we can observe a clear pattern: perceptions of threat and ethnocentric worldviews must be considered as the core drivers of Islamophobia. Thus, realistic perceptions of threat have greater explanatory power than symbolic perceptions of threat. The diffuse fear of an alleged Islamicization of Europe is not the root cause of Islamophobia. Rather, anti-Muslim prejudice is to do with security concerns and anxieties about the economic consequences of immigration. The prime reason that Muslims face prejudice in contemporary Europe, however, is an exaggerated perception of the us-versus-them divide. Put bluntly: it is ethnocentrism, stupid! (4) Our results indicate that the social-psychological dispositions of individuals had an impact on anti-Muslim prejudice long before the so-called refugee crisis. The anti-Muslim rhetoric now prevalent in the public discourse in Europe simply revealed – and, presumably, reinforced – pre-existing patterns of prejudice and discrimination. The electoral success of right-wing extremist and populist parties during the past few years could be an indication of this trend. (5) Islamophobia does not need Muslims to be nearby at all. Muslim communities are virtually absent in most Eastern European societies. Nevertheless, we can observe that anti-Muslim prejudice is more widespread in Eastern than in Western Europe. How to explain Islamophobia without Muslims? Our empirical results are in line with the assumptions of the contact hypothesis. The factual size of Muslim communities and contact with immigrants affect the extent of Islamophobia in European societies. The underlying individual-level effect is not a Western European peculiarity. Individuals from both East and West are less susceptible to Islamophobia if they stay in contact with immigrants, make friends with people of other ethnicities, and perceive these contacts as beneficial. Intergroup contact in general acts as an antidote to Islamophobia. However, it is important to note that the antidote of contact is very unevenly distributed across Europe. To date, Eastern European countries have been comparatively unpopular choices for immigrants when they decide where to settle. What results is that Eastern European citizens have fewer opportunities of contact than their Western European counterparts. Less contact with immigrants, however, is the prime reason for a social climate in which Muslims become more likely to face prejudice. Above all, it is this societal-level factor that is the core driver (and presumably even intensifier) of the macro differences that we found between Eastern and Western Europe. Edward W. Said, Orientalism, New York 1978. Samuel P. Huntington, The Clash of Civilizations and Remaking of World Order, New York 1996; Werner Ruf, Der Islam – Schrecken des Abendlandes. Wie sich der Westen sein Feindbild konstruiert, Köln 2014. Marc Helbling (eds. ), Islamophobia in the West. Measuring and Explaining Individual Attitudes, London 2012; Gert Pickel / Alexander Yendell, Islam als Bedrohung? Beschreibung und Erklärung von Einstellungen zum Islam im Ländervergleich, in: Zeitschrift für Vergleichende Politikwissenschaft 10 (2016), pp. 273-309; Andreas Zick / Beate Küppers / Andreas Hövermann, Intolerance, Prejudice, and Discrimination – A European Report, Berlin 2011. Robert Trait / Miloš Zeman / the hard line Czech leader fanning hostility to refugees / https://www.theguardian.com/world/2016/sep/14/milos-zeman-czech-leader-refugees /27.08.2018. Jan Cienski / Migrants carry ‘parasites and protozoa’, warns Polish opposition leader / https://www.politico.eu/article/migrants-asylum-poland-kaczynski-election / 27.08.2018. Daniel Boffey / Orbán claims Hungary is the last bastion against ‘Islamisation’ of Europe / https://www.theguardian.com/world/2018/feb/18/orban-claims-hungary-is-last-bastion-against-islamisation-of-europe / 27.08.2018. Sabri Ciftci, Islamophobia and Threat Perceptions: Explaining Anti-Muslim Sentiments in the West, in: Journal of Muslim Minority Affairs 32 (2012), pp. 293-309; Marc Helbling, Opposing Muslims and the Muslim Headscarf in Western Europe, in: European Sociological Review 30 (2014), pp. 242-257; Serdar Kaya, Islamophobia in Western Europe: A Comparative, Multilevel Study, in: Journal of Muslim Minority Affairs 35 (2015), pp. 450-465. See Alexander Yendell’s introduction to this journal’s special issue on Islamophobia in Eastern Europe. Gordon W. Allport, Die Natur des Vorurteils, Köln 1971. Henri Tajfel (eds. ), Social Identity and Intergroup Relations, Cambridge 1982. Walter G. Stephan / Cookie W. Stephan, Predicting Prejudice, in: International Journal of Intercultural Relations 20 (1996), pp. 409-426. Thomas F. Pettigrew, Intergroup Contact Theory, in: Annual Review of Psychology 49 (1998), pp. 65–85; Thomas F. Pettigrew / Linda Tropp, A Meta-Analytic Test of Intergroup Contact Theory, in: Journal of Personality and Social Psychology 90 (2006), pp. 751–783. Sabri Ciftci, Islamophobia and Threat Perceptions; Gert Pickel / Alexander Yendell, Islam als Bedrohung? Chris Allen, Islamophobia, Farnham 2010. Josh Lowe / President Erdogan slams European ‘Islamophobia’ after Human Rights criticism / / https://www.newsweek.com/turkey-erdogan-council-europe-eu-accession-589934 / 27.08.2018. Erik Bleich, What is Islamophobia. And How Much is There? Theorizing and Measuring an Emerging Comparative Concept, in: American Behavioral Scientist 55 (2011), pp. 1581-1600. Armin Pfahl-Traughber / Islamfeindlichkeit, Islamophobie, Islamkritik – ein Wegweiser durch den Begriffsdschungel / http://www.bpb.de/politik/extremismus/rechtsextremismus/180774/islamfeindlichkeit-islamophobie-islamkritik-ein-wegweiser-durch-den-begriffsdschunge / 27.08.2018. Luzie H. Kahlweiß / Samuel Salzborn, ‘Islamophobie’ als politischer Kampfbegriff. Zur konzeptionellen und empirischen Kritik des Islamophobiebegriffes, in: Armin Pfahl-Traughber (eds. ), Jahrbuch für Extremismus- und Terrorismusforschung 2011/2012 (II), Brühl 2014, pp. 248-263, here p. 263. Erik Bleich, What is Islamophobia, here p. 1584. Erik Bleich, What is Islamophobia, here p. 1585. Fatith Uenal, Disentangling Islamophobia: The Differential Effects of Symbolic, Realistic, and Terroristic Threat Perceptions as Mediators Between Social Dominance Orientation and Islamophobia, in: Journal of Social and Political Psychology 4 (2016), pp. 66-90, here p. 76. Amy C. Alexander / Christian Welzel, Islam and Patriarchy: How Robust is Muslim Support for Patriarchal Values?, in: International Review of Sociology 21 (2011), pp. 249-276. Gordon W. Allport, Die Natur des Vorurteils, here p. 20. Serdar Kaya, Islamophobia in Western Europe, here p. 451-452. Henri Tajfel / John Turner, An Integrative Theory of Group Conflict, in: William G. Austin/Stephen Worchel (eds. ), The Social Psychology of Intergroup Relations, Monterey 1979, pp. 33-47. Henri Tajfel / John Turner, An Integrative Theory of Group Conflict, here p. 39. Henri Tajfel / John Turner, An Integrative Theory of Group Conflict, here p. 40. Henri Tajfel / John Turner, An Integrative Theory of Group Conflict, here p. 41. Rossalina Latcheva, Measuring National Identity, in: Alex C. Michalos (eds. ), Encyclopedia of Quality of Life and Well-Being Research, Dordrecht 2014, p. 3941-3953, here p. 3943. Leonie Huddy / Nadia Khatib, American Patriotism, National Identity, and Political Involvement, in: American Journal of Political Science 51 (2007), pp. 63-77, here p. 65. Benedict Anderson, Imagined Communities. Reflections on the Origin and Spread of Nationalism, London and New York 1991. Mikael Hjerm, National Identities, National Pride and Xenophobia: A Comparison of Four Western Countries, in: Acta Sociologica 41 (1998), pp. 336-347. Detlef Pollack, Religion, in: Hans Joas (eds. ), Lehrbuch der Soziologie, Frankfurt am Main 2007, pp. 363-393, here p. 365. Gordon W. Allport / Michael J. Ross, Personal Religious Orientation and Prejudice, in: Journal of Personality and Social Psychology 5 (1967), pp. 432–435; Pazit Ben-Nun Bloom / Gizem Arikan / Marie Courtemanche, Religious Social Identity, Religious Belief, and Anti-Immigration Sentiment, in: American Political Science Review 109 (2015), pp. 203-221. Benjamin R. Knoll, “And Who is my Neighbor?” Religion and Immigration Policy Attitudes, in: Journal for the Scientific Study of Religion 48 (2009), pp. 313-331. Theodor W. Adorno (et al. ), The Authoritarian Personality, New York 1950, here pp. 208-220. Lynne M. Jackson / Bruce Hunsberger, An Intergroup Perspective on Religion and Prejudice, in: Journal for the Scientific Study of Religion 38 (1999), pp. 509-523. Gert Pickel, Perceptions of Plurality: The Impact of the Refugee Crisis on the Interpretation of Religious Pluralization in Europe, in: Ulrich Schmiedel / Graeme Smith (eds. ), Religion in the European Refugee Crisis. 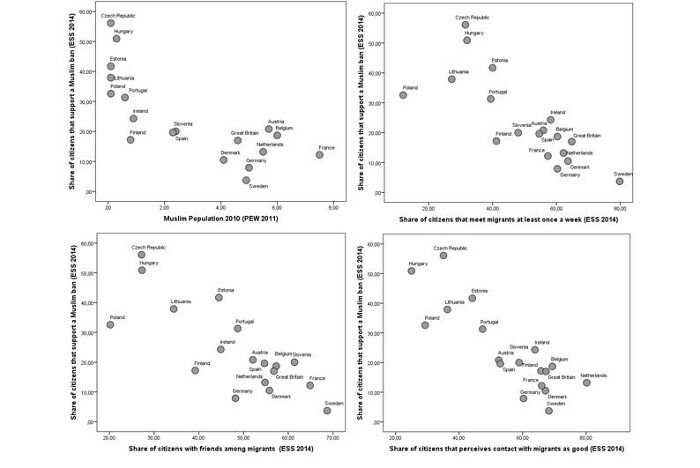 Religion and Global Migration, Cham 2018, pp. 15-38. Gert Pickel / Alexander Yendell, Islam als Bedrohung?, here p. 280. Wolfgang Benz, Antiislamische Diskriminierung, in: Albert Scherr / Aladin El-Mafaalani / Gökçen Yüksel (eds. ), Handbuch Diskriminierung, Wiesbaden 2017, pp. 511-527, here pp. 513-517. Marco Cinnirella, Think ‘Terrorist‘, Think ‘Muslim‘? Social-Psychological Mechanisms Explaining anti-Islamic Prejudice, in: Marc Helbling (eds. ), Islamophobia in the West. Measuring and Explaining Individual Attitudes, London 2012, pp. 179-189. Walter G. Stephan / Cookie W. Stephan, Predicting Prejudice, here p. 418. Robert Trait / Miloš Zeman: the hard line Czech leader fanning hostility to refugees. Daniel Boffey, Orbán claims Hungary is the last bastion against ‘Islamisation’ of Europe. Daniel J. Levinson, An Approach to the Theory and Measurement of Ethnocentric Ideology, in: The Journal of Psychology: Interdisciplinary and Applied 28 (1949), pp. 19-39. Daniel J. Levinson, An Approach to the Theory and Measurement of Ethnocentric Ideology, here p. 20. Jürgen Habermas, Die nachholende Revolution. Kleine politische Schriften VII, Frankfurt am Main 1990, here pp. 147-156. Daniel J. Levinson, An Approach to the Theory and Measurement of Ethnocentric Ideology, here p. 23. Thomas F. Pettigrew, Intergroup Contact Theory, pp. 65–85. Gordon W. Allport, Die Natur des Vorurteils, here pp. 267-287. Interpretation of Religious Pluralization in Europe, p. 25. Ahmed Saifuddin / Jörg Matthes, Media Representation of Muslims and Islam from 2000 to 2015: A Meta-Analysis, in: International Communication Gazette 79 (2016), pp. 219-244; Amir Saeed, Media, Racism and Islamophobia: The Representation of Islam andMuslims in the Media, in: Sociology Compass 1 (2007), pp. 443-463. Susanne Pickel, Methodologische Grundlagen des Vergleichs und Vergleichsdesigns, in: Hans-Joachim Lauth / Marianne Kneuer / Gert Pickel (eds. ), Handbuch Vergleichende Politikwissenschaft, Wiesbaden 2016, pp. 25-45, here p. 39. Henning Best, Logistische Regression, in: Henning Best / Christof Wolf (eds. ), Handbuch der sozialwissenschaftlichen Datenanalyse, Wiesbaden 2010, pp. 827-854, here p. 28; Susanne Pickel / Gert Pickel, Empirische Politikforschung. Einführung in die Methoden der Politikwissenschaft, Oldenbourg 2017, here pp. 169-182. Susanne Pickel / Gert Pickel, Empirische Politikforschung, p. 179. Zoltan Pall / Omar Sayfor / Why an anti-Islam campaign has staken root in Hungary, a country with a few Muslims / http://visegradrevue.eu/why-an-anti-islam-campaign-has-taken-root-in-hungary-a-country-with-few-muslims/ / 27.08.2018. Khalid Koser, International Migration. A Very Short Introduction, New York 2016, here p. 20. Gordon W. Allport / Michael J. Ross, Personal Religious Orientation and Prejudice, pp. 432–435. Alexander Yendell, Muslime unerwünscht? Zur Akzeptanz des Islams und dessen Angehörigen. Ein Vergleich zwischen Ost- und Westdeutschland, in: Gert Pickel / Oliver Hidalgo (eds. ), Religion und Politik im vereinigten Deutschland. Was bleibt von der Rückkehr des Religiösen?, Wiesbaden 2013, pp. 221-248, here pp. 226-231. Pew Research Center, Muslim Population by Country, in: Pew Research Center. Religion & Public Life 2011. The authors can provide additional empirical material on request. Gert Pickel: Nationalism and Perceptions of Threat – Ethnocentrism or Just a Lack of Contact? Islamophobia in Eastern Europe from a Comparative Perspective, in: Connections. A Journal for Historians and Area Specialists, 26.01.2019, <www.connections.clio-online.net/article/id/artikel-4680>.